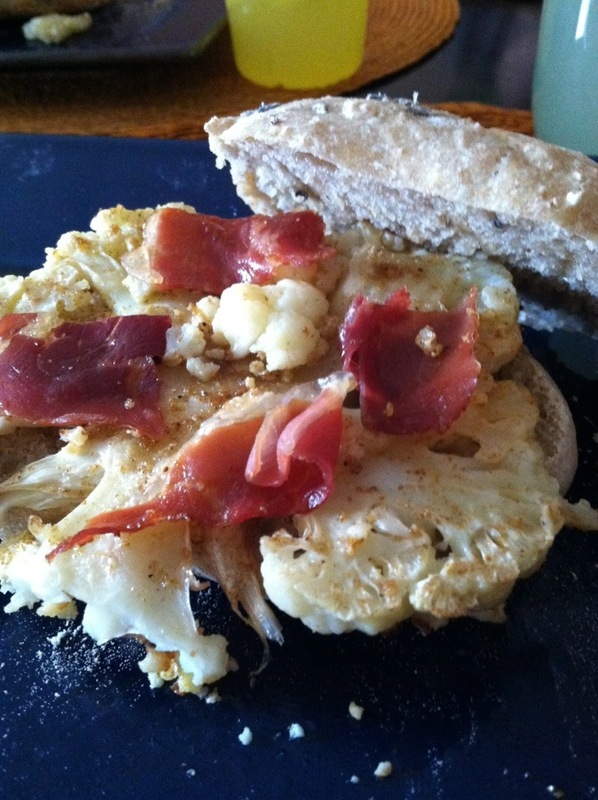 Duck Fat-Roasted Cauliflower Steak and Prosciutto on Lavender Sourdough | sandwich surprise! Frou-frou tasting menu-y, I know — I admit, I’m definitely a foodie who loves her delicious-sounding, exotically overwritten restaurant blurbs. This sammy is actually cheap and easy, and you can call it Roasted Cauliflower and Prosicutto on Sourdough instead, to de-pretentious it. Funnily enough, I didn’t realize that there’s a 2013 trend of “cauliflower steak” out there in Zagatland until I was writing up this post; it’s just a happy coincidence because oven-roasted cauliflower has become one of my favorite side dishes to eat at home over the past couple years. Cost: About $15 for 4 sandwiches. It’s about $1.50 cheaper without the lavender and the duck fat. If you decide to bake the bread, I used the recipe for the Zihuatanejo rolls, but with 2 cups of homegrown sourdough starter, 1 teaspoon organic yeast, 2 cups lukewarm water and 5.5 cups organic all-purpose flour and 1.5 tablespoon salt instead. 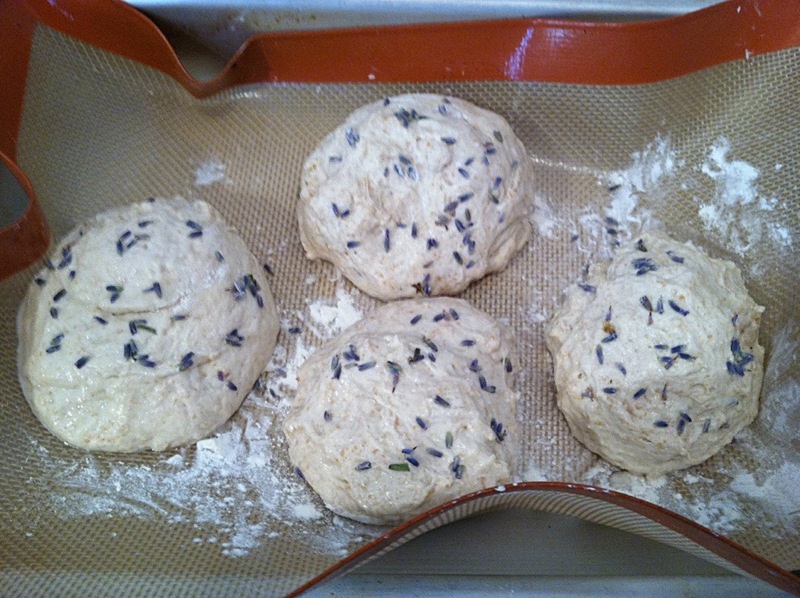 And when you make the rolls, sprinkle some lavender flowers on the outside of the dough and fold it once so it’s now inside the dough, and sprinkle some on top as well. To roast the cauliflower, preheat the oven to 350˚. Slice the cauliflower, not into individual florets, but in 1/2-inch horizontal sections across the head. Most other recipes call for slicing it vertically from top to bottom across the head, but either way works. Layer in a roasting pan. You can nuke the duck fat and then drizzle it over the cauliflower. I left it in a solid form and shaved little chunks to spread on top of the steaks. Sprinkle plenty of coriander on the steaks, and then season with paprika or cayenne to taste. 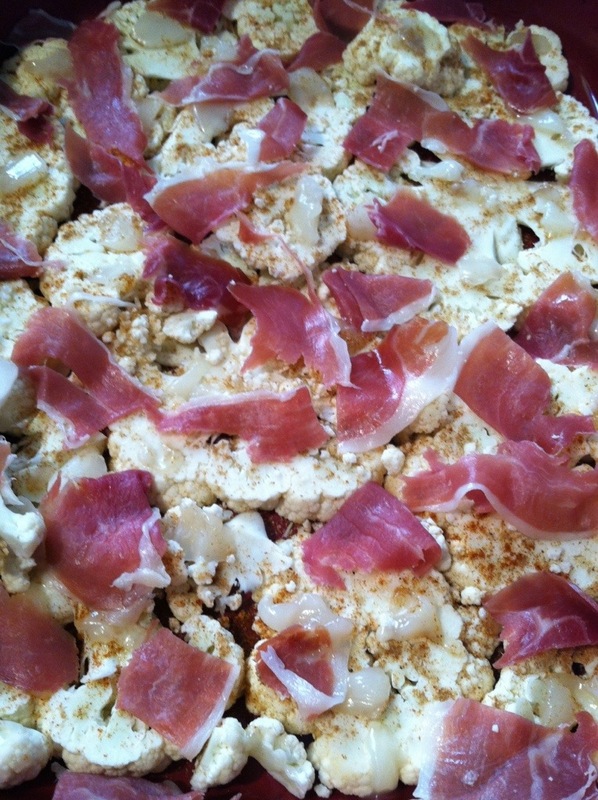 Tear or chop the prosciutto into 1.5-inch squares, and layer those on top of the cauliflower. 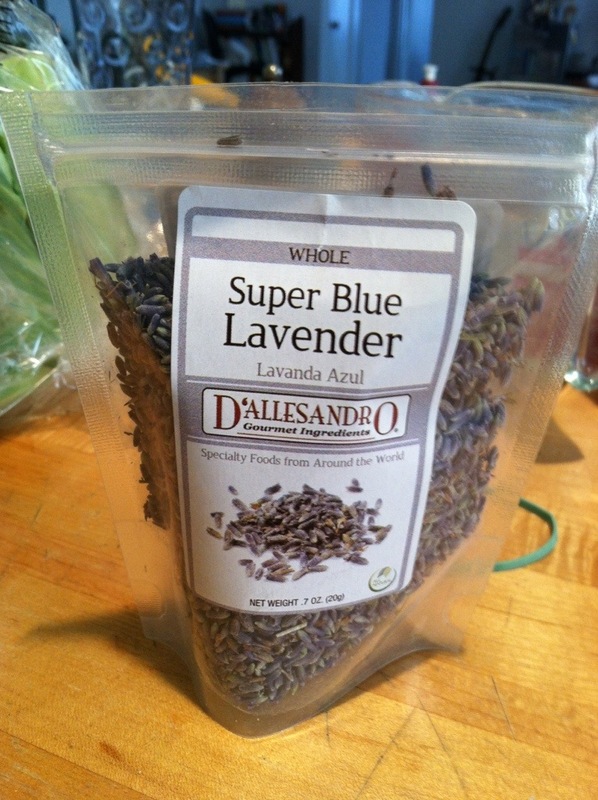 If you bought bread, you can sprinkle about 1 teaspoon lavender flowers over all of the steaks. Then put the pan in the oven on a center rack and bake for 35-40 minutes, until the cauliflower steaks are translucent throughout. Slice the rolls and using a spatula, take a layer of cauliflower and prosciutto out of the pan and put on the the bottom half of roll. I served the sammy to Aria on a Haleakala red sea salt sourdough roll instead because lavender didn’t seem too kid-friendly. “Is this egg?” asked Aria, eyeing the cauliflower. She broke off a tiny piece and tested it. 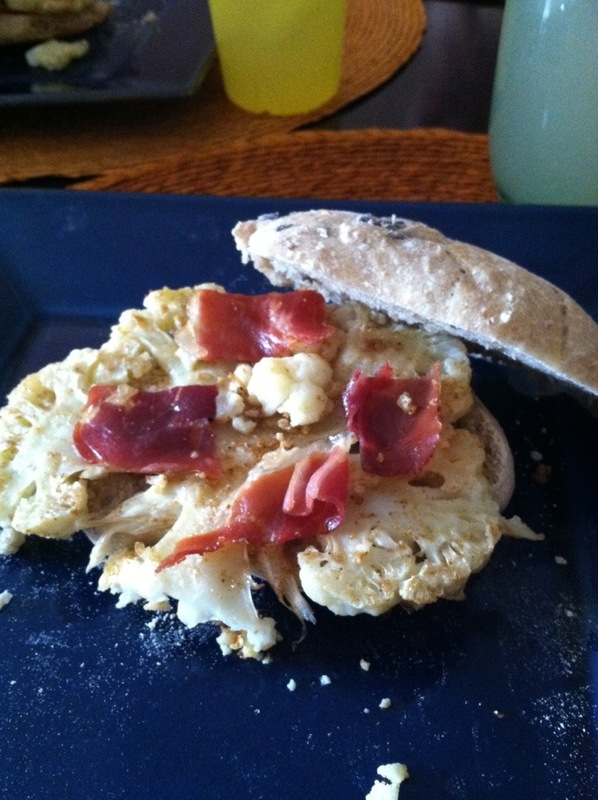 Then she kept picking off the cauliflower and eating more, avoiding the prosciutto and the bread. “Wow,” said Serena. 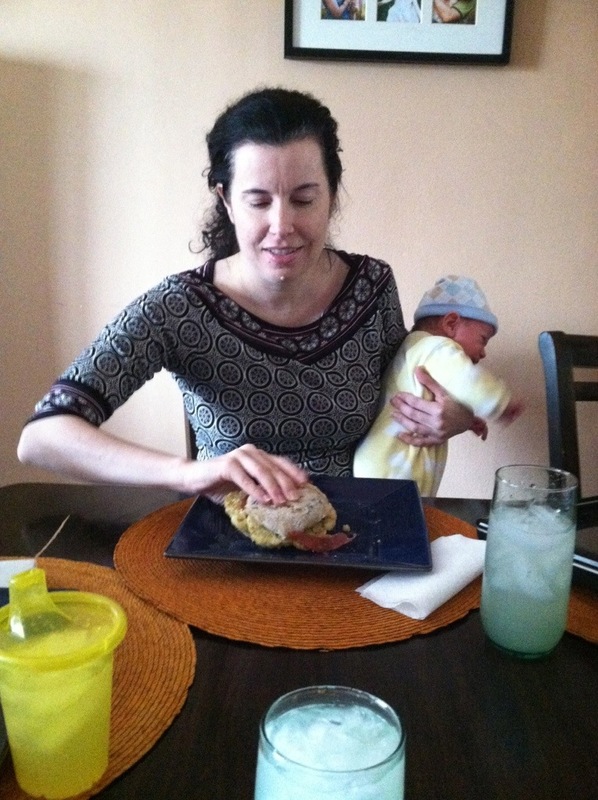 “I’ve never had cauliflower on a sandwich before. It’s so good. The lavender is delicious. It’s subtle and not overwhelming. In Persian cooking, they use unexpected floral flavors, like rosewater. This reminds me of that.” Serena’s husband, David, is Persian, so that was very cool to hear. 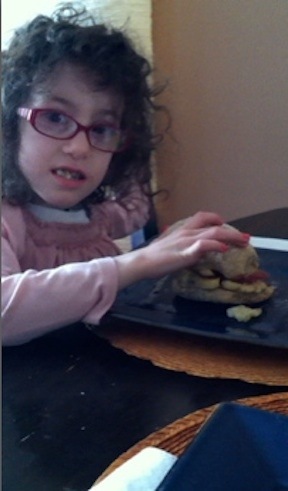 In the meantime, Aria was nibbling on the cauliflower and a little of the bread, but no prosciutto. She usually likes pepperoni and ham, so her mom was surprised that she wasn’t going near it. I hear you, Aria. I usually hate prosciutto because to me it has a tinny aftertaste. Roasting it takes care of that for me, but I can see how that strange taste may linger anyway. As always, let me know if you’re interested in being a Sandwich Surprisee, let me know! Just follow my Twitter account, like my Facebook page and/or subscribe to my blog and if I’m in your area (Sandwich Surprise is mostly in NYC, but does do occasional road trips), you could be surprised with a sammy soon! 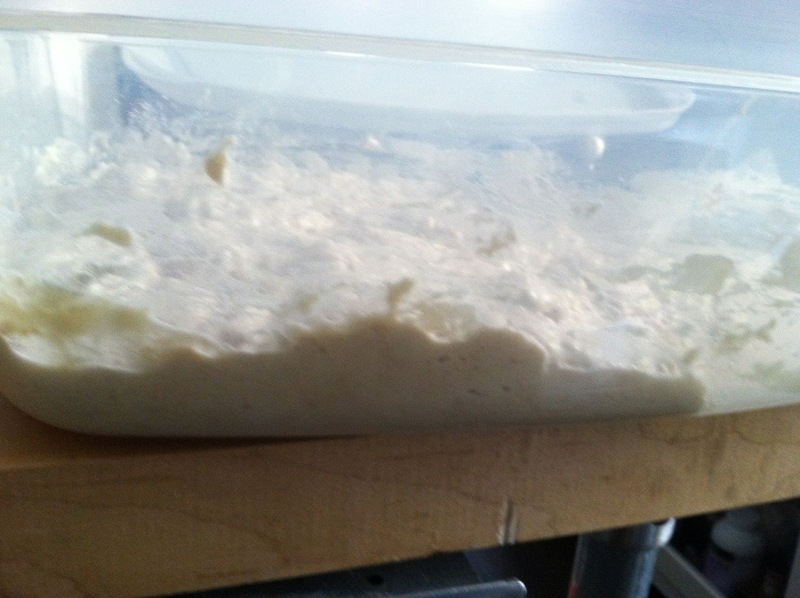 For my bubbly pet sourdough starter, I kept making bread dough in the same plastic container, just scraping the leftover dough and mixing it into the next batches without washing the Tupperware. I wasn’t going rogue, it’s what they recommend in Artisan Bread in 5 Minutes a Day. As long as there aren’t any pink or green or black or any other color molds growing, you’re good. 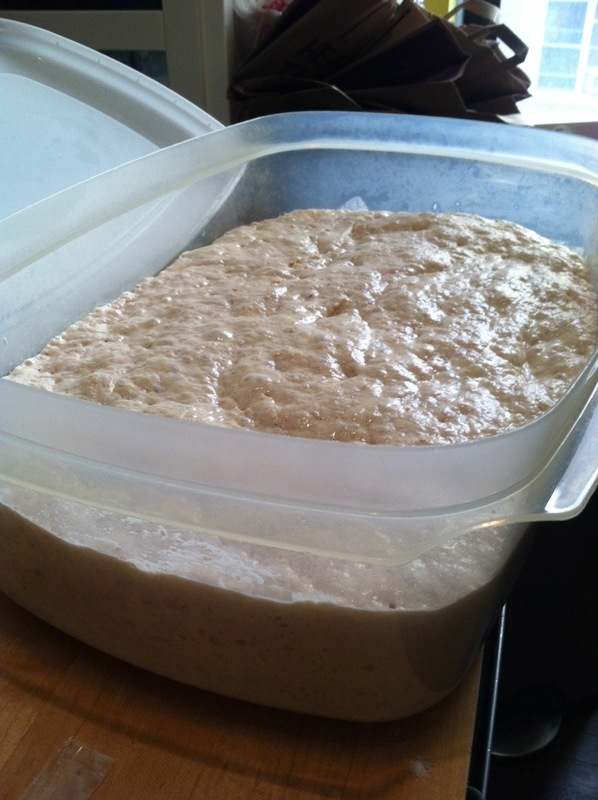 After about six or seven weeks of this, I had about 1 or 2 ounces of white, sourdough-smelling dough. I mixed in 4 oz. of lukewarm filtered water that sat out overnight to eliminate any chlorine and 4 oz. organic bread flour. I left that in a plastic container out on the kitchen counter overnight, covered with a clean, damp dish towel secured by a rubber band. I stirred it in the morning and fed it by mixing 1 ounce of lukewarm water and 1 ounce of bread flour and did the same thing 12 hours later, repeating the cycle for another day or two until the mixture was bubbly and had a sweet sour fermented smell.